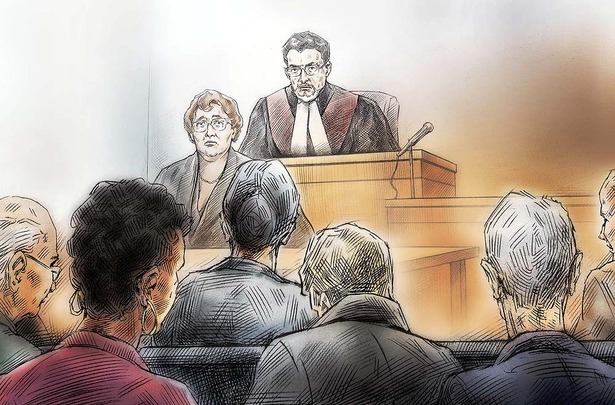 Illustration credit: Toronto Star - See Story "Small claims court: A place where justice can be pretty rough"
There have always been "small" claims. Small not because they are unimportant, but small because their monetary value is less than other claims. Even back in the early 19th century shortly after the Loyalists showed up in what is now Ontario, a small claims court was set up (at the time called Division Court) to handle their small disputes - from shoddy blacksmith work to bad animal feed. Today, no matter where you live, a small claims court is usually available for civil disputes. While one of the goals of small claims courts may have been to enable litigants to represent themselves, practically speaking small claims can still get complicated enough to benefit from a lawyer's assistance. The real benefit of such courts are less formal procedures, lower costs, and quicker timelines than higher courts. There's been a recent trend in Canada of quite dramatic rises in small claims court monetary limits. Although Newfoundland and Labrador is stuck in the basement with a $5,000 limit for small claims, and NewBrunswick and Quebec aren't much further ahead at $6,000 and $7,000 respectively, even "Canada's Ocean Playground" of Nova Scotia jumped its limit up to $25,000 - so it's appropriate that Ontario, British Columbia and Alberta are also up at that level. These rises in small claims jurisdictional limits haven't been gradual keeping pace with inflation kinds of things - in 2010, Ontario's limit rocketed skyward by a 150% increase from the old $10,000 limit. The fundamental idea involved in higher limits is access to justice. If it's way cheaper and faster to go to small claims court than other courts - and it clearly is, with or without a lawyer -- then why not let more people access those courts for a broader range of disputes? With the rise in monetary limits, it is now much more worthwhile hiring a lawyer to handle your small claims matter for you; hiring a lawyer for small claims court is going to cost you a lot less than hiring a lawyer to handle a higher value claim in another court because claims are a lot quicker to deal with. Hiring a paralegal and doing the claim yourself are also options. If doing it yourself, recognize that it will take up a fair bit of your time. If hiring a paralegal, make sure to ask about their experience in dealing with small claims, whether they are provincially accredited, and the insurance they carry. The thing to watch out for when preparing to go to small claims court by yourself is that life isn't television. "Hey," I hear you saying to yourself, "I know my life isn't a CSI episode!" But after seeing hundreds and perhaps even thousands of trials portrayed on television, and with reality shows like The People's Court and Judge Judy very loosely modeled after real life small claims, it's hard to completely clear your mind of their influence. Instead of the fast-paced, fluid, and largely paperless courts that you've become accustomed to from the television world, your experience with real small claims courts may feel ponderous, disjointed and filled with confusing paperwork. 1. Naming the wrong defendant - if you're going to sue, you need to sue the right person. Don't become confused between the name a business is operating under and its true legal name, which is the one you must name in your small claims court documents as the defendant. If the business is set up as a sole proprietorship, you need to name the natural person behind the business name; like Leaky Faucet Plumbing really being Bob Smith the plumber, so name Bob Smith. But if it's really Leaky Faucet Plumbing Incorporated that you've done business with, then name the corporation; or it might wind up being 905217 Ontario Ltd. that you need to name, the numbered company behind the operating business name. You may need to do a provincial or federal business name or incorporation records search before filing your small claims court documents to ensure you get the name right. 2. Asking for things the small claims court can't grant - the court's jurisdiction is almost entirely limited to money at $25,000 or under level. So don't ask for $30,000. And don't ask for an injunction to stop your neighbour from doing something that is bothering you. A Superior Court of original inherent jurisdiction has the power to give you your $30,000 and injunction, but the procedure will be more complex, it will take a lot more time, and cost more money; consider if you can live with that $25,000 from small claims court, even if you think you deserve something more. 3. Not figuring out how you are going to collect on your small claims court judgment before you go to court - collecting your court award can turn out to be a whole lot more hassle than getting the award itself. If a company or person is "judgment proof" - meaning they have no assets that are capable of seizure, or income that can be readily garnished - then you need to consider whether going to court is going to accomplish anything.